The Warwick Melrose Hotel in the Oak Lawn neighborhood is full of beauty and history to boot. Upon walking into the hotel, you immediately notice the opulence and the luxurious layout complimented in shades of crimson and gold. The hotel has greeted all kinds of celebrities from Tom Hanks to Liz Taylor and is widely known for its gracious hospitality and inviting atmosphere. A hidden gem inside the Warwick Melrose is the Landmark Restaurant. It delivers on the same luxury and taste as the hotel it’s contained in. First bite of the night was a tasty amuse bouche called the “Shrimp BLT”…a tiny but flavorful pairing of shrimp, bacon and bread with a tasty sauce included. 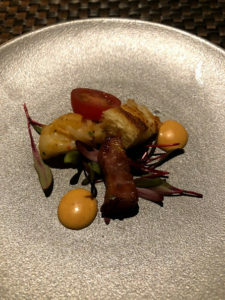 This was served at the suggestion of the Chef and we were so glad that he opted for this tasty treat to get our palates ready for the next course. 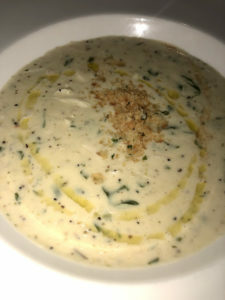 Also served at the suggestion of our Chef was a delightful Creamy Crab Bisque and a nice tall glass of the House Sauvignon Blanc. A must try that is off the menu, you’ll be so happy that you did. 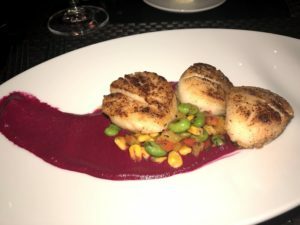 The adventure continued with the Pan Seared Scallops paired with a roasted garlic and beet puree and a sweet corn succotash. 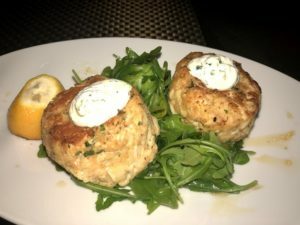 We also enjoyed a healthy portion of the Maryland Crab Cakes that were paired with a grilled lemon jam and a dollop of crème fraiche. It was easy to see all the love that went into those Crab Cakes, juicy and filled with flavor! 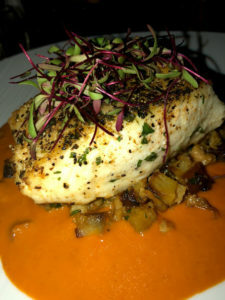 Next up is an Herb Crusted Halibut that was grilled to perfection. The saucy is an interesting mix of lobster bouillabaisse and accompanied with in season winter vegetables. A must try on their menu for sure. 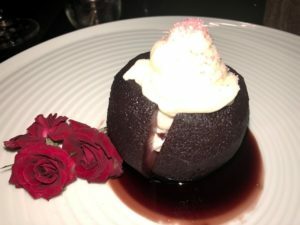 And as if your taste buds haven’t been tantalized enough, there’s a dessert here that would literally make your grandmother proud-The Drunken Granny! It’s a beautiful presentation of a Port Wine poached Granny Apple with a hefty serving of a house made vanilla infused yogurt and pink sprinkles for a touch of pretty. Special shout out to my waiter Bennie! He is an amazing server with great conversation, and he was partly responsible for most of the dishes I selected during my visit. The entire staff at Landmark Restaurant was very friendly and accommodating from the very minute I walked in, much appreciated! 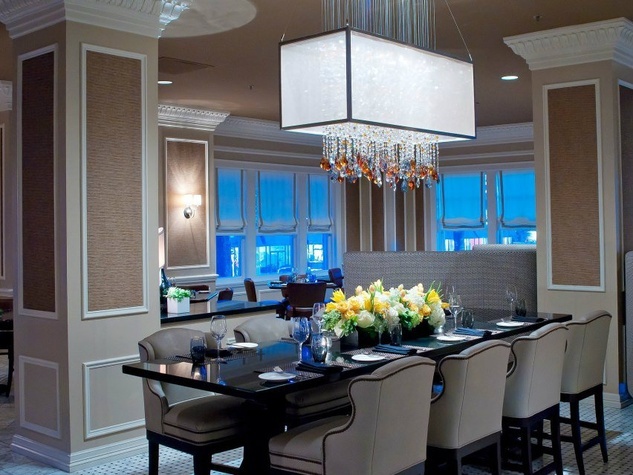 The Landmark Restaurant is located inside the Warwick Hotel in Oak Lawn at 3015 Oak Lawn Avenue. Dinner is served Monday through Saturday from 5:00 pm – 10:00 pm. Brunch is served Sunday only from 11:00 am – 2:00 pm. Disclaimer: All food was complimentary during my visit. All opinions are my own.